Saxophonist Dave Rempis has long been a stalwart on the Chicago jazz scene performing with Ken Vandermark and a host of others. This is the fourth album released on his new artist run label Aerophonic which so far has showcased a wellspring of ideas. This album is a collaborative endeavor between Rempis on alto and baritone saxophone, Joshua Abrams on bass, guimbri and small harp and Avreeayl Ra on drums and percussion. “Ruah” opens the album with slow and exotic percussion and low saxophone tones, buoyed Abrams' array of stringed instruments. On “Noria” Rempis focuses on slow long tones of saxophone and Abrams answers on bowed bass. Things slowly ramp up with skittish percussion, bowed and plucked bass and an increasingly ripening saxophone that leads to a fiery maelstrom. Moving into thrilling free jazz, there is a section of wailing saxophone over nimble drumming and bass. The group backs backs off to a fine bass solo accompanied with gentle spacious drumming and long tones of saxophone all working together in a patient fashion. Dynamics from hard to soft and from fast to slow keep the music unpredictable as the waves of music build tall and powerful as strong hard blowing encourages the whole band coalesce in rippling muscle. Raw powerful saxophone cries out emotionally, culminating in massive full throttle playing followed by a drop off to circular wails of saxophone and bowed bass. They wrap up this epic improvisation with strong full band section, and there is a killing conclusion of over the top sax blowing and crashing drums and bass. Joshua Abarams has a bass solo to open “Saqiua” in a Jimmy Garrison like fashion, followed by crying and keening long tones of saxophone. Ra’s gentle malleted precision keeps the music open and breezy with unusual tones. All instruments are on a level playing field, working together for a greater good. Abrams takes another bass solo, and he carries it off very well showing many ideas, before Rempis enters once again and the piece ends with raw and circling saxophone probing. 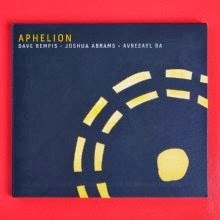 Aphelion - Aerophonic Records.